Brandon studied at the University of Texas at Arlington and has studied privately with many well-known professors at UNT, Berklee College of Music, and UTA. He began playing percussion at the age of eleven and is currently active as an internationally touring recording artist. Brandon has recorded albums with Cas Haley, Jamie Richards, Grammy award winner John Beland, and many others. He has extensively toured the US, Canada, and Mexico for the past ten years. 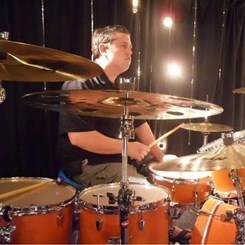 Brandon offers a unique teaching method that incorporates basic fundamentals and various playing styles.